by Dr Arnold Rabbow Coat of Arms no 186, Summer 1999. The lions in the Royal Arms of England came onto the heraldic scene some eight hundred years ago – but from where, and why, remains obscure. The creatures, -three lions passant guardant – are truly striking and unusual and were no doubt particularly so when they first appeared,1 gold and in pale on the king’s red shield. That Otto did not care more about heraldic protocol and about the feelings of his subjects, was due both to his upbringing and his descent. He was more Anglo-Norman that German, having been raised in England where his father, Henry the Lion, erstwhile Duke of Saxony and Bavaria, lived in exile after forfeiting his territories by his opposition to Emperor Frederick the Redbeard. Otto, a grandson of King Henry II of England through Henry’s daughter Mathilda, who had married Henry the Lion, was the favourite nephew of King Richard I, who oversaw his knightly education and bestowed high favours on him. The young man, being unusually tall for his time, excelled in the martial arts to the delight of Richard the Lionheart, whom fate had denied him. In 1196 Richard created Otto Count of Poitou and Duke of Aquitaine, tantamount to Viceroy, of the English possessions in France with the exception of Normandy (which Richard retained for himself). Presumably, the King assigned arms to Otto on that occasion, and indeed a seal (1197) of Otto as Count of Poitou has survived.3 It is tantalising, however, that his arms are not visible, because we see Otto, on horseback, riding from left to right displaying only the back of his shield.4 Considering the fondness of Richard for his nephew he may even have planned to make Otto his successor on the English throne 5 because he was averse to his brother John or, eventually, of John’s offspring succeeding him. In 1198, however, Otto was called into an even higher rank, being elected King of the Romans by the anti-Hohenstaufen party in Germany. Just when exactly Otto adopted his Anglo-German arms is uncertain. The first pictorial evidence dates from 1209, but it is likely he has already employed the design c 1198, possibly in order to maintain a claim to the English throne. Indeed this may be the reason why he chose to combine the English lions with the Imperial eagle. Matthew Paris, who depicts Otto’s arms twice, reports that he assumed them at his coronation in 1198 “out of love for the King of England”. But even apart from his uncle’s predisposition towards him, as a grandson of Henry II Otto ranked high in the line of English succession. 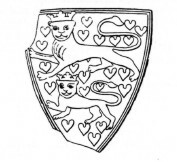 Otto had an older brother, Henry, Count Palatine, who also bore lions passant, but in his case two not three 6 as is depicted on his seals dating from around 1196,7 and these arms later became those of the Duchy of Brunswick, and lasted until 1918. It is just possible that Otto himself may have borne two lions – and in later depictions of his German bearings he is indeed accorded two8 but this most probably reflects Brunswick’s local tradition rather than historical fact. The German evidence indicates that by 1198 two versions of arms with lions passant guardant – one with three, one with two lions – were well established and existed simultaneously. Hence the question arises as to which was the senior version? Among British historians, conventional wisdom hold that the English Royal Arms developed in a seemingly natural way: one, two, three, which sounds reasonable, but in fact the evolution was quite complex. A lot of important reasoning has been brought forward to support the alleged arms of Henry II,11 and certainly that monarch was aware of the symbolism of the lion in Arthurian and other legends and several of his relatives are known to have borne lion arms of some kind or other. But, as far as Henry II himself is concerned, unfortunately no arms of his have ever been found.12 Even given the varying survival rates of historical documents this is strange, The king certainly issued a great many grants and warrants so had he used an armorial seal, at least one or two impressions should have been preserved. But the sad fact is that we lack any real proof of arms borne by Henry. It is often overlooked that heraldry, still rather new in his day did not spread from the top of the social ladder downwards, but from somewhere in the middle – from the landed gentry and the military, both downwards and upwards. High personages like kings or emperors assumed arms only relatively late.13 Only when heraldry gained wide popularity did it become unthinkable that a noble person should not possess arms and hence legendary heroes like King David or Alexander the Great, and even the three wise men, Jesus Christ, and Death, were attributed coats of arms. Only in and after the late 12th century, several decades after the birth of heraldry did sovereigns begin to identify themselves by heraldic display. The first English king who can be proven to have borne arms is Richard I (1189-99). Two great seals of him still exist. On the first Richard bears a shield with a single lion rampant. This was replaced by a new Great Seal, the matter is anything but simple. To start with, the date of adoption of the three lions by Richard is not quite certain. Although there is written testimony that he had a new seal made for him in 1195, he continued to use his first seal. Of his second seal, the first impression that has survived dates only from 1198. It is strange that three years elapsed before we find any proof of Richard actually using his new seal – so accordingly, we cannot be quite sure whether the three lions seal was indeed the instrument of 1195. 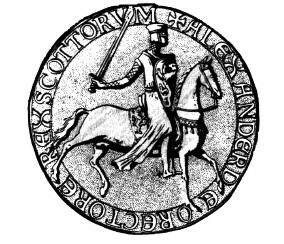 The matter is made more complicated because some British scholars believe that Richard also bore two lions combatant, based on the fact that on his first seal the lion rampant is facing sinister. But this must not be over interpreted. Other early seals exist showing beasts so facing,15 and it is always possible that the engraver chose to make the lion face as it did to symbolically defy enemies. When further considering one lion rampant or three passant we must also bear in mind that in the 1190s the shield remained kite-shaped after the Norman style rather than heater-shaped style as was more popular later. Into such geometry a lion rampant fits nicely, as do three beasts passant in aesthetically pleasing fashion,16 but two lions passant do not – even appearing to “float” surrounded by empty space. Of course, as in the case of the English lions, we may also ask: Why three lions passant? The answer seems obvious, just like Richard found it convenient to top everybody else’s arms in England, the Suabian Hohenstaufen, from whose ranks had come all German Kings and Emperors since 1138, wanted to stress their premier rank among all German princes with a non plus ultra coat. It would be most natural for Richard to have been inspired by this arrangement to base his own along the same lines. But there could be even more to it, for when Henry VI released Richard, his new vassal, he might well have bestowed on him a variant of his own family coat of arms, but it is interesting to note that this would not have been an eagle coat. Several German princes bore such, clearly derived from the imperial bird. But, compared with Richard, they were lesser princes, rulers of marches on the outskirts of the Empire. Richard’s status was higher, even as a feudatory of the Emperor, who could not deceive himself into believing that he had added a new tributary state to his realm. He was well aware that their feudal relationship was personal. So he may have conferred on the king a variant not of his arms of dominion but, on a more personal note, of his family arms. However I must admit to a time problem. As noted above, Richard’s three lions date from the 1190s. But then, so do the Suabian beasts – first seen on a seal of Duke Philip (around 1196-1198), two to four years after Richard had returned to England. The last Suabian ruler to display the single rampant animal was Konrad (d 1196), the last known instance being in 1192.19 But armorial ensigns were changed at will and it could well be that Duke Konrad adopted the three lions some time between 1192 and 1196. Most Danish scholars have denied any German connection with their royal arms,22 considering the often strained relations between the two countries, that is understandable. But again, such a connection would have been perfectly natural, because Denmark in the 11th and 12th centuries acknowledged the Emperor’s suzerainty over their country. Interestingly, the English two lion version also has a parallel in Denmark. 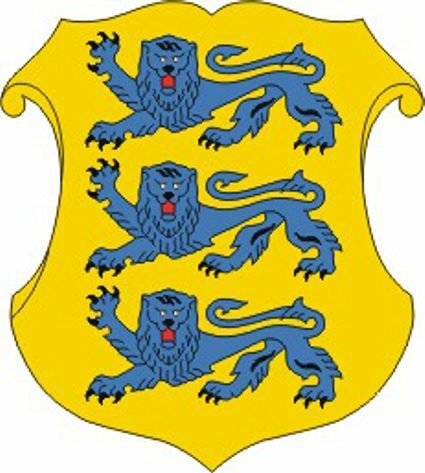 The Dukes of Slesvig, junior members of the Danish royal house, were given two azure lions on a gold field. These have survived as regional arms, Holstein. So, the “lion family” is alive and well in Europe, the Channel Islands, and the New World. The English beasts have migrated to Canada and Virginia,23 and have “fathered” offspring in Normandy, Guyenne, lions have reappeared in Estonia, having previously been suppressed by the Soviet overlords. The Suabian lions which were never quite forgotten, were resurrected in 1954, when the German state of Baden-Württemberg, which we may term “Suabia revived”, re-adopted them. I shall not dwell here on possible different meanings regarding the terms “lions” and “leopards” in early heraldry. A full account of all known representations of Otto’s arms and other symbols of sovereignty is given by Bernd Ulrich Hucker: Kaiser Otto IV., Hannover 1990, pp. 558-602. François Eygun: Sigillographie du Poitou jusqu’en 1515, Macon 1938, p. 160, nr.7. Werner Paravicini: Die älteste Wappenrolle Europas: Ottos IV. Aachener Krönung von 1198;, : (Archivum Heraldicum CVII) 1993-11, pp. 99-146. Hucker, op. cit., p. 17, and other authors before him. Bernd Schneidmüller: “Die Siegel des Pfalzgrafen Heinrich bei Rhein, Herzogs von Sachsen (1195/96-1227)”;: Niedersächsisches Jahrbuch für Landesgeschichte, Vol.57, 1985, pp.257-265. 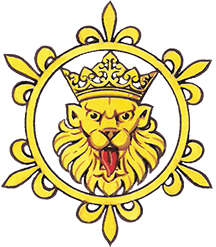 The document depicting Henry’s two lions seal is preserved at the State Archives in Dresden (O.U. 113). Adrian Ailes (see note 9) states (p. 61) that Henry “seems to have been using the two lions shield” even before 1195, but the earliest actual proof is the document of 1196. On a 14th century glass window in a Brunswick church (Hucker, op. cit., fig. 14). op. cit., pp. 54-63; Gerard J. Brault: Early Blazon, Oxford 1972, pp. 20-22. Nicholas Rogers (“The shrine of St. Mengold at Huy and its heraldic importance” The Coat of Arms, nr. 127, 1983, pp. 176-182) has brought to light an intriguing case of the three lions possibly appearing in the 1180’s or even 1170’s, i.e. as early as Henry II’s reign – if indeed the shrine were that old. The saint, an alleged son of a legendary English King Hugh, wears a surcoat with three heraldic lions passant guardant. However, the author himself admits that the heraldic elements of the shrine, when analyzed in regard to style, seem to have been finished considerably later, between 1200 and 1220. The French royal arms do not appear until 1223 (Louis VIII), although the kings of France made use of the fleur-de-lys in other ways much earlier. See Hervé Pinoteau: Héraldique capétienne, Paris 1979, p. 3. When heraldists study arms, they are chiefly concerned with their symbolism and supposed meanings, whereas they tend to neglect more practical and down-to-earth aspects, Reflections on the Art and Science of Heraldry;” Genealogica & Heraldica, Lisbon 1986, pp. 495-503. 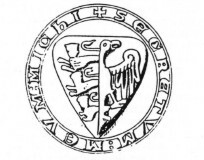 Although an early theory that he used this seal already in 1177 has been discarded, he may have used it since 1185, when he was 18 and knighted by his father. See Adrian Ailes: “The seal of John, Lord of Ireland and Count of Mortain;” The Coat of Arms, N.S. vol. IV, nr. 117, 1981, pp.341-350. See Felix Hauptmann “Die Wappen in der Historia minor des Matthäus Parisiensis”: Jahrbuch der K. K. heraldischen Gesellschaft “Adler”, N.S., vol. 19, 1909, pp. 20-55 (pp.22, 32). Cecil Humphery-Smith, who also asserts that Richard’s motive in adopting three lions was that he wished to difference himself from the others of his line: “it is also likely that Richard harkened back, albeit with some cynicism, to the allegiance he had given to the Staufen Emperor”. “Why three leopards?” Arma, 100, 1982, pp. 1290-1294. Nils G. Bartholdy: Das Löwenwappen der Waldemarer. Eine Hypothese der politischen Motivaton der Dänen könige für Annahme der Löwenfigur im 12. Jahrhundert, Les orig¬ines des armoiries, op. cit., pp. 15-21. 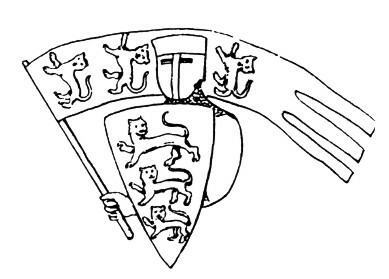 However, another Danish scholar advocated the Hohenstaufen connection of the Danish arms, and even hinted at the link between Henry VI and Richard, (Sven Tito Achen, Danmark, Heraldisk Tidsskrift, nr.20, 1969, pp.445-449). Cecil Humphery-Smith (op. cit., p. 1294) draws a parallel to the English arms. In his opinion the Danish arms reflect the refusal of Canute VI to renew his homage to the Emperor; he “chose the Danish lions …for a similar reason of defiance”. Coat of Arms of the Virginia Company (argent, a cross of St. George gules, accompanied by the crowned shields of England, Scotland, Ireland, andEngland), in use from 1619 to 1707: illustrated by Whitney Smith The FlagBook of the United Stores, revised edition. New York 1975, p.228.